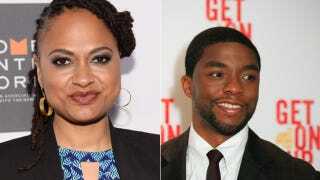 Ava DuVernay is making history yet again. The Selma director has been hired to helm Black Panther, Marvel’s first black superhero movie, as the company’s first black female director. The film will star Chadwick Boseman, who has played James Brown and Jackie Robinson, respectively, in biopics. If the comics are any indication, the story of Black Panther will take us to the fictional African nation of Wakanda where we’ll see a clash between the American government (represented by Martin Freeman), white industrialists (represented by Andy Serkis), and local Wakandians (represented by Boseman) over the valuable metal Vibranium (represented by Captain America’s shield).